Recently I was asked to contribute to a preaching series on the life of Jacob. I’m posting my notes below in the hope that they might be useful to you in your Christian walk and discipleship. This morning we’re going to spend a few moments considering a passage from the book of Genesis, a short episode from the life of Jacob. 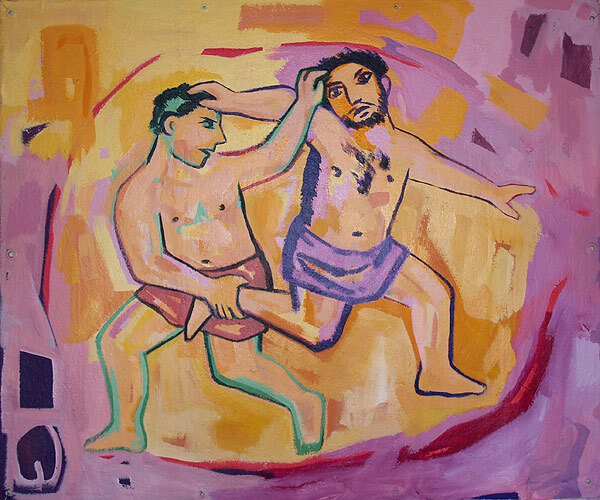 Jacob, we know, was the younger of twins, a brother to Esau, both sons of Isaac and Rebecca, and right from the very start of the narrative we learn that this wasn’t going to be a heart-warming story of brotherly connectedness. God’s words to Rebecca, even during her pregnancy, spoke of separation rather than unity, of enmity rather than love. The writer of Genesis records these words, ‘… the LORD said to her … two nations are in your womb, and two peoples from within you will be separated … one people will be stronger than the other, and the elder will serve the younger …’ (Genesis Ch.25 vs.23). And, even from the outset God’s words started to bear fruit, since, at the moment of arrival into the world the younger twin Jacob was born grasping hold of the older twin Esau’s heel, trying to pull the older back, striving to gain personal advantage and predominance, desperate to be first. Jacob’s name is a play on the Hebrew word for heel and it literally translates as twister or deceiver, an apt name, so it transpired, since the story goes on to tell instances of Jacob’s deceit and scheming, firstly by out-witting Esau into selling him the birthright that legally resided with the elder twin in exchange for a bowl of soup, and then secondly, with help from his mother Rebecca, Jacob tricks his almost blind father Isaac into laying hands on him so that he might be in receipt of the family blessing that was rightfully Esau’s. Philosopher George Santayana describes family life as ‘… one of nature’s masterpieces …’, but this family is something quite different, instead of being a masterpiece, all we see here is a mixed up jumble of unconnected pieces that will never be interlocked without the help of the Master, God Himself. And so it was that when the deception was exposed, Jacob had no choice but to run away from the family home. Yet despite the mess he was in God met with Jacob through two dramatic circumstances, one, by way of a dream that he experienced the first night of his journey running away from home, and the second, by way of a wrestling match that occurred the night before he returned home – a return that would eventually find him reunited with his brother Esau – a wrestling match, with none other than God Himself. Some twenty years separated those two encounters with God and we know from reading the story in Genesis that Jacob returned home a wealthy married man with two wives, Rachel and Leah, with a growing family, comprising of ten sons, and a whole assortment of possessions, livestock and servants. But, if we were hoping that Jacob’s life story would turn out to be a happy one from here on in then Genesis Ch.34, the very next chapter, brings us up with a start. Because it’s a twisted, mangled train-crash of a chapter, and whilst we aren’t going to read from it together this morning, it does provide an important backdrop to the passage we are going to read, because whereas Ch.34 makes no mention of God, the first fifteen verses of Ch.35, in contrast is full to the brim with God, and it’s here that we find Jacob, having first returned to the family of his earthly father Isaac, now returning to his heavenly Father, to God Himself, as once more God speaks to him. Wherever we look in the unfolding story of the good news of the Bible we find a stream of evidence reminding us that God, at the very heart of His character – is a relational God. Time and time again we see God’s patience working within the lives of individuals – patience that reveals His restorative grace, as God seeks to draw people back to Himself. Jacob, like all of us at some time or another, finds himself spiritually distant from God. Jacob, as we can see time and time again in the unfolding story seeks to gain advantage through self-reliance. Jacob believed that his timing was better than God’s that his actions alone, separate from God’s will, would bring the results he was looking for. In reality the whole catalogue of stories that are bound together to form Jacob’s life story up to this point reveal a chain of poor choices that reaped their inevitable consequences – and yet, as we commented earlier, God wasn’t finished with Jacob. The verses we read together have as their starting point a fresh revelation of God to Jacob – and we find that in the introductory phrase, since despite the bleakness of the situation that was threatening to consume Jacob and his family in Shechem this is what we read, ‘… then God said to Jacob …’ (vs.1). Let’s consider for a few moments something of the substance of what God has to say to Jacob, words that lead to repentance and renewal. But let’s not merely limit our thoughts to the outworking of those words within the structure of this well-known story but rather let’s see if we can draw encouragement and hope from the lessons they teach – lessons that are just as relevant for us today in our encounters with the same God, the God of Jacob. God’s first words to Jacob are by way of a reminder to him that he was living and worshipping in the wrong place. At the end of Ch.33 we read that Jacob, soon after his reunion with his brother Esau, bought a plot of land from the sons of Hamor, at a place called Shechem, rather than returning to Bethel the place of his first encounter with God and the place where he had vowed to God that he would return. And so we learn that despite knowing what God required from him he stopped short in his obedience. I guess for many of us we can find ourselves in similar circumstances to that of Jacob. God’s call upon our lives is one of obedience, and the evidence of God’s word and the reality of the indwelling Spirit within us confirms God’s leading to be essential for our spiritual lives, and yet, because of our self-reliant nature we, at times, believe we know better and we chose self over God – and as a result we find ourselves living in a spiritual wilderness, a place where we have chosen to live, rather than where God desires longs for us to be. Yet even when we find ourselves spiritually in the wrong place God persists in working to draw us back to Himself, not physically of course, to a geographical Bethel, but rather we are directed towards the cross of Jesus Christ. Because there, for all of us who know Jesus Christ as Saviour and Lord, is the place to which we need to return. If our spiritual walk with God has come to a halt then we, like Jacob, need to find our way back to the place of our first encounter with God – return to the place where we made a vow to follow Him, the place where we made a choice to accept Him as Lord, that place of faith and trust – and that place, for us, is always the foot of the cross. God’s intention for Jacob is clear. He isn’t merely asking him to travel as a sightseer to Bethel, but rather God is re-settling Jacob in a place of His choosing – Bethel is the place where God wants Jacob to both live and worship, and whilst there’s some uncertainty amongst scholars as to the exact geographical site of OT Bethel the reality is that both of the suggested locations, though disputed, are within only a few miles of Shechem. Jacob had come so far and yet he had missed out on finding God’s intended purpose for his life – because, he had stopped relying on God. Discerning God’s will for our lives and His intention as to where He wishes us to live, work and worship for instance, is, I would suggest, never easy or straightforward, and maybe God’s guidance is only truly revealed in hindsight. However, what we do know for certain is that in accepting Jesus Christ as our Lord and Saviour we have been given, by God’s grace, an eternal address in an eternal kingdom, the Kingdom of God, a kingdom with counter-cultural values and topsy-turvy principles to many that we see championed around us. It’s refreshing that in the next few verses we see Jacob taking the initiative within his household by relaying God’s message to them, as a family. Jacob recognises the seriousness of God’s words to him and he recognises his need to be reconciled with the LORD God. Rachel, Jacob’s wife, we discover back in Genesis Ch.31, had stolen her father’s pagan idols just before she and Jacob’s household has fled Paddan Arran, and it is clear from the reading that Jacob knew of the presence of other idols too, as well as the outward signs of idolatrous acceptance that the members of the household displayed publicly, such as ritual rings. The evidence of scripture shows, of course, that worshipping the god’s of the neighbouring pagan nations would always be a temptation for the children of Israel. Even despite the confirmed reality that there was no god that could possibly be compared to the LORD God, the children of Israel were time and time again seduced by the confidence and prosperity they saw around them – yet, such attractions were temporary illusions. Maybe even in these verses we glimpse reluctance amongst the people to truly rid themselves of idolatry. Why did Jacob choose to bury these things rather than destroy them ? Why leave open the possibility of uncovering again these tangible and seductive tokens of idolatry rather than ridding themselves of them for good ? Being challenged by God to change the habits and patterns of our lives, those habits and patterns that are not God-honouring, can be deeply uncomfortable since what God demands from us is evidence of our faith and trust in His Lordship over and above any self-appointed position of rule that we proudly flaunt as being our right. So much of what our sinful human nature finds attractive – is ultimately destructive and so God strives, through His Spirit to reveal to us the true nature of such things. And, the good news of God’s provision for us through His Son is that not only that are we ultimately saved from the penalty that our sin deserves, through the vicarious death of Jesus Christ on the cross, but also, through the indwelling of His Spirit we are being changed, albeit very slowly in my case, towards Christ-likeness, as we allow the Holy Spirit to act through His sanctifying power. God’s intervention on our behalf to deal with the sin question was a costly one – and in response the question I have to ask myself time and time again is how serious am I about dealing with those areas of temptation that, if unchecked, have the potential of causing such great harm ? The people put away their idols and signalled their willingness to follow God by washing themselves. Throughout scripture we find the action of changing clothes and washing revealed as a re-occurring motif signalling the start of something new. Old garments signify an old way of life, and just like dirt, sin spoils and defiles and must be washed away – repentance and faith go hand in hand and God reveals His power, in response to the people’s obedience, by providing safe passage to Bethel (vs.5) – a miraculous intervention when viewed in the light of Ch.34. Back in Ch.28 God had promised to bring Jacob safely back to Bethel, and He kept His promise, since God is always true to His nature. And Jacob responded by keeping his part of the agreement He had made with God by building an altar and leading his whole household in worship. For Jacob Bethel was a special place, yet it’s important to see that in renaming again the place formerly called Luz he is careful to give God the pre-eminence – and he calls the place El Bethel. And then, in vs.9 God appears to Jacob once more and this time, unlike the story concerning the wrestling match where God refused to reveal His identity, this time God tells Jacob His name, ‘… I am God Almighty …’, here is El Shaddai – the provider God, the God who is all-sufficient. I’m sure this is a good place to finish our brief look at the life of Jacob this morning. Not only do we find Jacob reunited with his brother but now he is re-united with his God. Now he is in the place of God’s choosing, he has returned to God in an attitude of repentance and faith, typified by his sacrificial pouring out of a drink offering that speaks volumes about determined dedication – but also, the LORD God has spoken with him and God has re-affirmed his promises. Jacob, the deceiver and self-serving grasper has had his new name Israel re-affirmed to him. The name Israel means ruled by God – clearly God is at work in the life of Jacob. As we close our thoughts about Jacob it’s important that we take a moment to consider individually where we are spiritually with God. Have we in faith and trust come to the foot of the cross in repentance ? Are we continuing in the way that God would wish us to go ? Do we daily acknowledge Jesus Christ as our Lord and Saviour and live in the reality of His Kingdom ? Are we allowing God to change us, removing those things that would damage the effectiveness of our Christian lives ? The Christian life should be a thrilling and vibrant adventure. It’s not devoid of heartache and sadness, a fact that Jacob would discover again as the story of this chapter unfolds, but life with God is ultimately a secure life, a life held tight within the grasp of the covenant of God’s continued blessing – a blessing that stems from the person and work of Jesus Christ. Apostle … should we use ‘a’ or ‘A’ and does it matter ? Only recently during a conversation at Home Group I was reminded of the trend amongst some Christian groups to call those leading them Apostles. 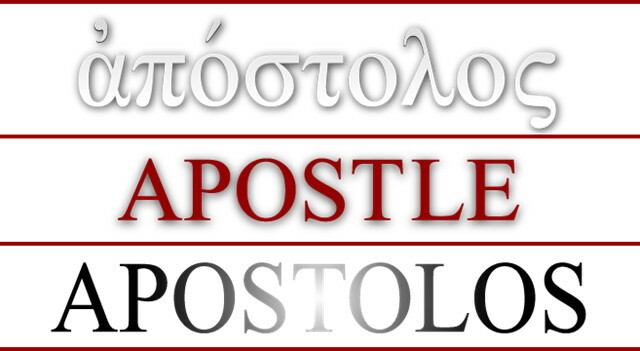 I don’t mean small ‘a’ apostles, the ‘sent ones’ or ‘ambassadors’ of the gospel, which is what the word ‘apostle’ literally means (more or less) – a term that should have relevance to everyone who professes to be a Christian. But I mean capital ‘A’ Apostles, those who view themselves to be modern-day equivalents of Peter or Paul. Whilst it appears to be a common practice to do this capitalising of the word in order, I assume, to denote importance either by the individual themselves or by those in their congregations I remain unconvinced that Scripture gives support to such a claim, and here are some brief reasons why I say that. If Apostleship was an ordinary church office, there would be no need for the regular apologies made for Paul’s Apostleship. Certainly there would be no need for the kind of language that he uses here in 1 Corinthians. If one’s birth can be described as abnormal, then it implies that there is a normal Apostle, and normal equates to an ordinary eyewitness of the resurrection. In any event, Paul was a witness of the resurrected Christ, so the suggestion is that his abnormality has more to do with the fact that he was appointed at the wrong time (after the possibility for eyewitness discipleship had expired) and outside of the ranks of the Twelve. In the cited bit of Ch.12, Paul shows the gifts that God has ordained, listing Apostleship first, and prophecy second. At the beginning of Ch.14, Paul reminds the church again to desire the greatest gifts, but specifies the second gift, prophecy, not the first, Apostleship. Why is Apostleship best for the church, yet we’re supposed to desire second best ? Because Apostleship belonged to a small group of eyewitnesses of the resurrection, who were commissioned to speak on behalf of Christ himself, but it does not belong to the church of every age. Prophecy is the best of the gifts that are offered to the whole church. Apostleship never was. So, Christ appointed Apostles to speak for him after his departure, and they have done that speaking. There is no indication anywhere that Apostleship itself was passed on; that primary office in the Church died with the last of the Twelve. Yet Apostles remain first of all for the church, because they continue to bear witness in scripture, by their word in letter. SLIDE 1 In 2005 Time magazine carried an essay by the Nobel prize winning physicist Eric Cornell in which he posed this question; Why is the sky blue ? Cornell went on to offer two brief answers to his own question, firstly he said, ‘… the sky is blue because of the wavelength dependence of rays scattering …’, and he continued by saying, ‘… secondly, the sky is blue because that is the colour God wants it to be …’. Cornell wrote further that, as an expert in the field of optical phenomena, he was well qualified to speak about his first answer. However, he said, the second answer, whilst having been voiced for thousands of years was not in the least undermined by the advances in scientific understanding that gave rise to the first answer. SLIDE 2 There is, Cornell went on to say, ‘… a legitimacy in thinking of the wavelength dependence of rays scattering as the method by which God chooses to implement His colour scheme …’. I wanted to start our consideration for this morning with Cornell’s comments because they follow on from the topic you thought about last week about science and theology coexisting together as complimentary sources of information rather than, as is so often assumed, opposing viewpoints that stand poles apart and by their nature, consistently at odds with each other. Quite clearly this morning we run the risk of having some overlap from the topic last week since there’s no way we can think about the creation of the universe without touching on matters of science; but I trust that what I say this morning will add to what was said last week rather than merely repeating it. SLIDE 3 So, let’s spend some time looking at our question for this morning. Is the universe just an accident ? or to put it another way, Why does anything exist and not nothing ? Whilst these might be short questions they doesn’t have short answers since these are questions that impact upon other huge questions such as Why are we here ? and, Does my life has any meaning ? So, whilst we can’t hope to look at every avenue of thinking that feeds into a complete answer, even if that could be done, I trust that we will together be encouraged to think more about the impact of such questions upon our personal faith and also the kind of thinking required in attempting to formulate answers to this and similar big questions. SLIDE 4 So where do we start ? Well, the most obvious place is to start at the beginning, and the beginning of the story is the opening verse of the book of Genesis. Whilst we don’t have time to consider the chapter in any depth it’s worthwhile noting that Ch.1 acts as the prologue to the book, and in its turn, the book of Genesis acts as the prologue to the entire Bible since it’s the book of beginnings. And just as an operatic overture introduces all of the themes of an opera to the expectant audience, so it is that Genesis introduces the reader to the great themes that will dominate scripture. It is in Genesis that we learn of the creation of the world and of humankind’s rebellion against God’s rule. It is here that we learn of God’s decision to restore his creation back into relationship with Himself and we learn of God’s intention to do that through His chosen people and ultimately through the work of His Son, Jesus Christ; through his death and resurrection. In short, Genesis sets the scene for the unfolding story of salvation, which is the story of the rest of scripture. Yet in starting at the beginning we’re immediately aware that Ch.1 of Genesis is not a straightforward piece of writing and, in part, that’s because it’s written in a style that we aren’t overly familiar with, since the writing is much closer to poetry than it is to prose. Now that’s not to say that what the writer wishes to communicate to us is in anyway less true than say the narrative historical writing style of Luke as he writes his gospel, but we have to be mindful that literal reading of poetry can at times become nonsensical. In the Psalms for instance we find David talking about God’s creative sovereignty. SLIDE 6 In Psalm 8 the Psalmist writes, ‘… when I consider the works of your fingers the moon and the stars that you have set in place, what are mere mortals that you are mindful of them, human beings that you care for them ? …’. And when we read that, of course we know that God isn’t flesh and blood like we are and so He doesn’t have fingers; so we don’t read this in a literal way. But, and this is important, in no way does that fact take anything away from the truth that is being spoken about. The Psalmist wants us to know that God is personally and intimately involved, not only in the creation of the world, but also, he writes, God has a desire to draw us into relationship with Him. And in many ways that truth is better presented for us in this poetic style because the use of language and imagery engages us on a very personal level. It’s also worth noting in passing something about the context in which these opening words of scripture were written. Most Biblical scholars seem to be in agreement that Genesis was written some 1500 years BC, at a time when there was a plethora of competing views about creation circulating around the pagan lands that bordered the land of Israel. All of the major nations of the time had their own myths and stories, and Genesis was written as a direct challenge to the myths of the Babylonians, the Canaanites, the Egyptians and the Assyrians. It’s true that some of these myths have certain similarities with the poetic account of Genesis Ch.1 but in reality they are fundamentally different as we will see. One of the many creation stories tells of a war between rival deities that resulted in the victorious god slitting open the stomach of a god he has defeated, and from the divided contents of the stomach, that god created the heavens and the earth. In another creation story a band of lesser gods go on strike and the higher gods are forced to create humankind in order to do the manual labour that the lesser gods are now refusing to do. But here in Genesis we note a fundamental difference from these kinds of stories since in the Biblical account there is no hint of conflict or warfare, no disagreements between competing deities, and neither is there any confusion regarding the identity of the creator, since it is God. And it’s the God who is eternally present because He was, ‘… in the beginning …’. So God purposed creation, He chose to create the universe, and more than that, He was overjoyed with what He had made; we see that repeated through Ch.1 of Genesis. The poet speaks of God as an artist, standing back, as it were, to view his masterpiece and commenting upon it. The Hebrew word for good used here, is elsewhere translated as beautiful, such is God’s work of creative activity. SLIDE 8 But there’s more, because we are told that the pinnacle of God’s creation is humankind, you and I. And it’s because of the opening chapters of Genesis that we accord dignity and value to one another. If this opening chapter of the Bible is mere myth or poetic fiction then, it ought to follow, that there is no sanctity to human life since we are no more sacred than a worm; but of course no-one believes that. But where does that belief come from ? Well, put simply, It’s derived from the fact that we are made in God’s image and likeness, whether we acknowledge it or not. God designed a world for us to live in. He purposed creation and brought it into being as a direct act of his free will. SLIDE 9 So how ought we to view God’s interaction with creation ? Well, the early part of Genesis tells us that pantheism is wrong, that idea that God is part of the created world and exists in everything; but that’s not what scripture tells us, since God is eternal and outside of time. And neither is deism right, that idea that God is unmoved by and distanced from His creation, the thinking that, whilst God might possibly have set everything in motion, He now has no further interest. SLIDE 10 But neither of these points of view stand up against the revelation of scripture, because here, we meet an Almighty and personal Creator God. A God who is both transcendent, that is He is different in substance from created things, and who is also imminent, that is, He is involved in His creation. And more than that, amazingly, God desires to share in a relationship with you and I. And it’s when we turn to the NT that we discover more about what that means and the way by which God chooses to become intimately involved in His creation; and it’s through the person and work of Jesus Christ. The first few verses of John’s gospel are strikingly similar to the beginning of Genesis, and we’re reminded that God’s response to humankind’s rebellion is not to distance Himself from us, but rather, it’s the reverse, since He draws closer to us. And the imagery of light is important. In both accounts, whether that of creation or the unfolding story of God’s re-creation; His work of salvation and restoration through the death of Jesus Christ on the cross, both are described as bringing light and life. SLIDE 12 And whilst we may have differing views as to the interpretation of the opening chapters of Genesis, it’s fundamentally important that we notice the fact of God’s creation over and above any consideration as to the manner of God’s creation. Since, in reality, Genesis wasn’t written to answer the how question but only the why question since Genesis Ch.1 introduces us to the personal Creator God who despite His transcendence is knowable – a fact we see most clearly in the person and the work of Jesus Christ God’s Son. That said, it’s interesting that the current pervading scientific position of cosmologists purports that the creation of the universe happened at a moment of unimaginable power some 15 billion years ago, an event that saw the creation of all matter and elements out of nothing; the so-called Big Bang. I mention that purely because it’s a scientific theory, that at least at first glance, seems more in tune with scripture than any scientific theory held sacred by previous generations of cosmologists. 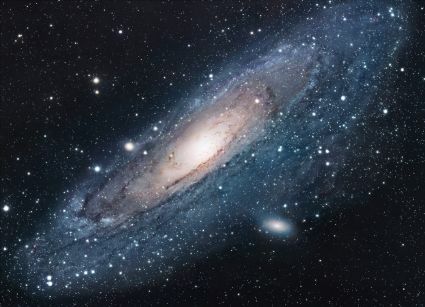 Is it very difficult for us as Christians to see God in the Big Bang ? Interestingly many scientists are re-evaluating their positions in the light of what they have discovered because the implications are huge. The appendix to Flew’s book includes the transcript of a discussion with NT Wright, the Bishop of Durham, in which Wright challenges Flew to think further. In reality Flew had moved from a position of atheism to a position of theism, the belief in some God rather than no God at all. But, says Wright, the clues in the universe points to a God who is knowable and relational, a God who stepped down into this world in order to restore and re-new His creation, a God who through the person and work of His own Son Jesus Christ brings purpose and life to a world ravaged by sin. Yet whether Anthony Flew reached that point of acceptance before his death only God knows. And Jesus’ supremacy as the creative channel for His Father’s decision to create the world is nowhere better seen than in the opening chapter of Colossians. It’s another poetic work in fact, a similarly subversive work that sought to challenge the worldview of the culture of the time, that belief that Roman Caesars were gods. Paul sets out the full extent of the power and the majesty of Jesus Christ, the Son of God. Let’s finish this morning by reading Paul’s words, inspired as they are by God’s Spirit. These words are a reminder of God’s purpose in creation and of God’s intent to restore His creation back to Himself. They speak of the Servant King and the one who will one day finish the work that was started way back in the beginning of the book of Genesis. Just recently I was invited to preach on the relationship between science and faith and inevitably in discussions with individuals afterwards I was asked this question … Can I believe in both science and the Bible ? In reply I gave the short answer to the question, which is yes, as many scientists who are Christians will tell you. However, the longer answer is more complicated ! Whether you think you can believe in both science and the Bible depends upon what you’re expecting to get from each of them. For example, where should we go for answers to questions as diverse as: Where does rain come from ? What is lightening ? Is there a God ? So let’s start with the Bible. It is an ancient document produced over at least 1,000 years in many diverse settings, as well as being God’s word. The question is: what should we expect from the Bible, and how should we correctly read it ? The key thing is to consider the genre of the thing you are reading; in other words, what type of literature is this ? We all know about genre, but rarely realise it ! We read a letter from our bank manager differently to a letter from a spouse, because they are different genres. In the same way we read the poetry in Psalm 18 vs.2: ‘… the LORD is my rock, my fortress, and my deliverer …’, differently to Acts Ch.27 vs.29, ‘… fearing that we would be dashed against the rocks, they dropped four anchors from the stern and prayed for daylight …’. The latter clearly refers to a physical rock which destroys a boat, the former means that God is like a rock to the Psalmist, ie. He is dependable, strong and solid. So genre matters when we read the Bible, otherwise we might mistake what the author was trying to say. The genre of a text determines the kind of thing you should look to get from reading it. Let’s look at Genesis Ch.1, for example, which is the narrative of the seven-day creation (it may help you to go and read it before you carry on reading this post). What kind of literature is Genesis Ch.1 ? It’s a narrative, because things happen in it, and it has some features of poetry as well: repeated phrases (for instance, ‘…and God said …’ and ‘… according to their kind …’, and many others), and a repeated structure in how each day is described. In Genesis Ch.1, many words and phrases are found three, seven or ten times; the introduction contains thirty-five words, earth is mentioned twenty-one times, God is mentioned thirty-five times (interestingly, all multiples of seven). All this suggests that the genre of Genesis Ch.1 is a mix of poetry and narrative, and that the author was very interested in the symbolism of numbers, as well as telling us something about God. Is this the kind of text which you would expect to get scientific information from? As Ernest Lucas says in his book Can we believe Genesis today (IVP, 2005): ‘… the more we look at Genesis Chs.1-3 … the more it becomes clear that the meaning of the passage is essentially theological, not historical or scientific …’ In other words, the point of Genesis Ch.1 is to tell us that God is the Creator of the universe, not exactly how (scientifically) God did it. The main point here is that the Bible is not a scientific document, it’s a theological one. We should go to the Bible to find out about God, not about science. Now let’s turn to science. What should we expect science to tell us ? The aim of science is to explain how things happen in our world. Science is concerned about mechanisms – how does an earthquake occur for instance, or how does a cell turn cancerous ? Science is limited to studying repeatable, observable and measurable phenomena – and it’s very good at doing it ! However, the study of mechanisms is not all there is to life: we could describe in great scientific detail how butter, flour, sugar and eggs, when combined and heated, make a cake, but it would tell us nothing about what the cake was for – a birthday party, maybe. Similarly, we may think that it’s good to care for the poor and to help those who are less fortunate than ourselves but that’s not a scientific conclusion, it’s a moral one. Science isn’t everything and, more specifically, it certainly can’t tell us whether there is a God or not. God is not a mechanism within the universe, and therefore, quite rightly pure science leaves to one side the question of God and simply gets on with studying things within the world. 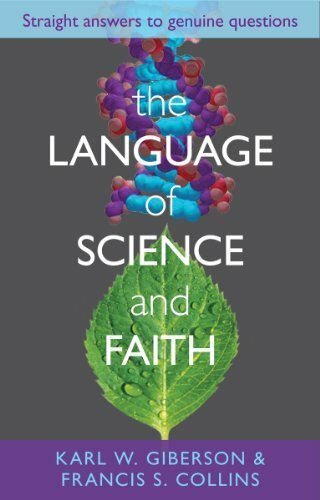 So science and the Bible are concerned with very different parts of life: science with how this world works, and the Bible with questions of meaning: why are we here ? Is there anything worth living for ? Is there a God ? As a Christian, science for me is about finding out how the world which God made works. Science is thinking God’s thoughts after him, but we cannot even begin to try and answer the question as to whether there is a God or not using science. Isaiah is the king of the major prophets. His writings are among the most profound of all literature, and his prophecies are the most distinctive in all the Bible. Isaiah was a prophet, a statesman, and an accomplished orator. His ministry was extensive, spanning many years and many topics, and it was far-reaching in its influence. The final forty years of the eighth century BC produced many great men and world leaders, but the greatest of these was the prophet Isaiah. His name means the eternal One is salvation, and he often engages in a play on words using his own name to emphasize the central theme of his ministry: salvation by faith. The historical background of Isaiah can be found in 2 Kings Chs.15—20 and 2 Chronicles Chs.26—32. The first verse of Isaiah Ch.1 gives us the vital historical information that allows us to pinpoint precisely when the prophet lived, where he lived, and, if we are the least bit familiar with Hebrew history, what the conditions were like while he lived and worked. We know nothing about Isaiah’s father, Amoz, except that Amoz shouldn’t be confused with Amos, the minor prophet. What we do know is that by the time young Isaiah arrived on the scene, Israel had fallen into degenerate times. His arrival on the scene was just as timely and fortuitous as Moses’ many generations earlier. In Acts Ch.7:20, Moses is called no ordinary child and we can say Isaiah was also no ordinary child. In a world that had become so distorted through sinful rebellion, and full of despair and hopelessness, the vision that came to Isaiah came at exactly the right time. God’s time is always the right time and God always has the perfect way of revealing to human beings both their sin and guilt and His compassion and mercy. Both of these aspects of God are revealed in this chapter. Even though God was addressing His people only, His message was meant to be heard by both heaven and earth. Here we see God, standing up as it were, stating His case before the whole universe against His stupid and disobedient people. God is calling all creation, terrestrial and celestial, to hear His complaint – His lawsuit. Isaiah pictures God as a father whose children have snubbed their collective noses at Him and gone their own way and are doing their own thing without regard to what their Father wants. God had nourished them and brought them up out of the wilderness and into the land of privilege and plenty. He had given them everything and more, yet without a moment’s hesitation, as soon as they were able to, these children spurned their heavenly Father, turning against Him. We as Christians have got to ask ourselves, have we not also been the recipients of tremendous blessings ? 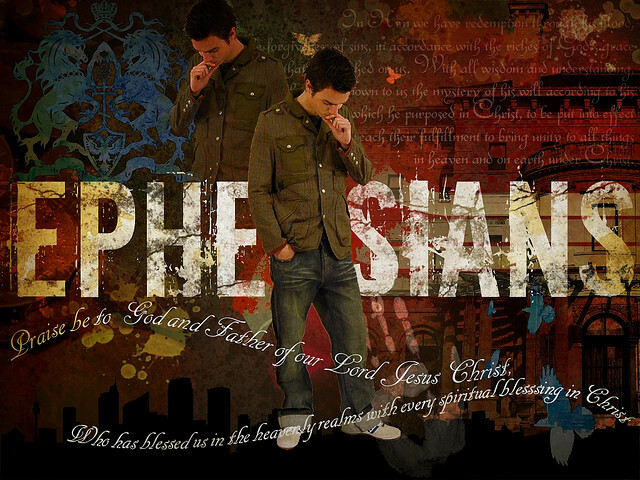 Have we also shunned and ignored God, our heavenly Father ? Let’s think about that as we look at how Israel had rebelled against God. To be inconsiderate means to be thoughtless and thankless. The house of Israel had become just that toward Jehovah, their owner and provider. It is a terrible thing to become so self-centered that we cease to think about the work of God and stop considering all that He was done and is doing for us. Think about it; what preoccupies your thought-life during any given day ? Do you reserve thought about God for just before you drop off to sleep at night, before each meal, and a little longer on Sundays ? You may justify that thoughtlessness by saying, God understands I have to work … raise my family … God knows how busy my life is … there are only 24 hours in a day, you know ! The thing God understands is that when you spend 95% of your waking hours thinking about your life and 5% thinking about Him, you’re inconsiderate ! When you start treating God as shabbily as that, you are already on your way to becoming a backslider, whether you know it or not. It isn’t much a walk from treating God with contempt and presumption to leaving Him altogether. Their thoughtlessness resulted in a willful, deliberate departure from Jehovah. When a Christian begins to take God for granted and when he treats God with an arrogant presumption that says , He’ll always be there no matter how I treat Him then pretty soon that Christian slips into a backslidden state. This is an incredibly dangerous position to settle into, for the backslidden state happens so gradually that when one is aware of it, it no longer matters. From the dictionary : Perverse – obstinate in the wrong; stubborn; intractable; hence, wayward; vexing; contrary. This pitiful description of Israel was both real and symbolic. Physically, they were suffering as a result of sin and spiritually they were killing themselves bit by bit. Nothing they did could stop the national hemorrhaging. You are the salt of the earth. But if the salt loses its saltiness, how can it be made salty again? It is no longer good for anything, except to be thrown out and trampled underfoot. (Matthew Ch.5:13)1. It all sounds so depressing and hopeless. But we serve a God of hope ! We serve a God who doesn’t give up easily. Just when we think there is no hope; when we think we’ve committed the sin that would forever separate us from God, along comes God with this amazing offer. Israel of Isaiah’s day had fallen far but not so far as to be out of God’s reach. That’s how God works. He doesn’t wait for us to get right before saving us. While we were at our worst, Christ died for us. Amazing love. The first thing we need to understand with this statement is that God is pressing His people to make a decision. It’s an invitation, but it is also an ultimatum: repent and be forgiven. The second thing that strikes us is God’s use of the word us in His call. God recognizes and declares our kinship with Himself. God does not reason with animals. He reasons with people capable of reasoning with Him. The last thing that should be pointed out is the word settle (or reason as we have it in other versions). It is a legal word that means to decide a case in court. But instead of pronouncing judgment on guilty human beings, our Judge offers us pardon ! God condemns sin and sinners, but thank God that’s not the end of the story. Scarlet and crimson were the colours of the robes worn by the princes to whom Isaiah preached. God’s promise was that, even though one’s sins may be as irremovable as the stain of blood, grace could restore purity of character. God can do that because not only is He the offended One, but He is also the Judge. God’s power is in and behind this great promise; His power can turn the sin-stained, scarlet-dyed clothes that make up our filthy rags into a the white robes of a blood-washed saint ! This is God’s ultimatum. A lot of us wish God had finished speaking at the end of verse 18 ! This condition, or warning, cannot be ignored. That little word if is most important and it makes it plain that God has honoured the soul of man by giving him a part in his own salvation. Man cannot and does not initiate the call to salvation nor can he save himself in any way, but note this: God cannot forgive an unrepentant soul. A sinner must exhibit repentance – God cannot do the repenting. That is man’s responsibility. Human beings are always given a choice. 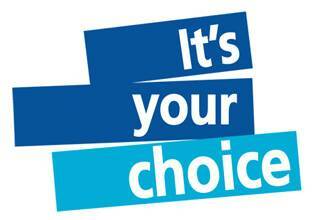 In our day, people don’t like to choose; we like others to make the hard choices for us. But in the Kingdom of God, it all begins with choice. God chooses us, and we must choose to follow Him. There is a certain poignancy to this book – it is John Stott’s farewell – his final publication. Over the years he has produced dozens of books covering Biblical exposition right through to engagement with all kinds of contemporary issues. His book The Cross of Christ is certainly a contender for the best Christian book I have ever read, and his contributions to the Bible Speaks Today series are amongst the best on offer (Sermon on the Mount, Romans, Acts, Galatians, Ephesians, 1 & 2 Thessalonians, 1 Timothy & Titus, 2 Timothy). He is one of the most widely respected evangelical leaders in the UK, and deservedly so. So when he writes a farewell book, it’s definitely going to be worth paying attention to. 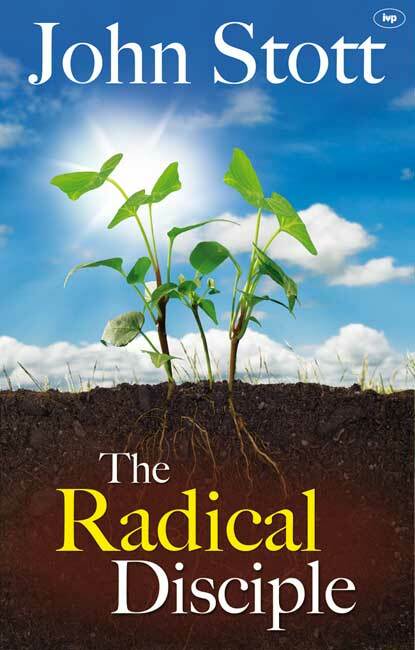 The book is a call for us all to be radical disciples. To be radical is to be deep-rooted and whole-hearted. Stott picks out eight areas to explore in which we can become more committed followers of Jesus. A fourth area is creation care. The simple fact that this chapter is here shows Stott’s commitment to applying Scripture to contemporary issues. He starts by building a biblical case for our responsible stewardship of the earth, avoiding the two extremes of deification of nature and exploitation of nature. He commends the work of Tearfund and A Rocha, and calls us to be deeply committed to care for the creation. A fifth area is simplicity. John Stott speaks from a position of integrity on this subject, since his book sales and speaking engagements could have made him a millionaire, yet he practices what he preaches, giving all his book royalties towards the work of providing books for believers and pastors in poorer countries. He feels grieved that the International Consultation on Simple Lifestyle which took place in March 1980 received very little attention, and this chapter is simply given to republish their statement (which he co-wrote with Ron Sider). This is a very challenging chapter, and one that exposes deep-seated idols that we are reluctant to part with. In conclusion, this is a book you will want to read if you have had any contact with John Stott’s teaching ministry before. Though he is far too humble to say it about himself, it comes from a man who has fought the good fight, finished the race, and kept the faith (2 Timothy Ch.4 vs.7). He has not asked us to do anything that he has not modelled first in his own life. It is a fitting farewell from a remarkable servant of God and I pray that his vision of radical discipleship will be fully embraced by the next generation.